In the first two portions of this series, we discussed potential causes of water leaks in your home plumbing system. 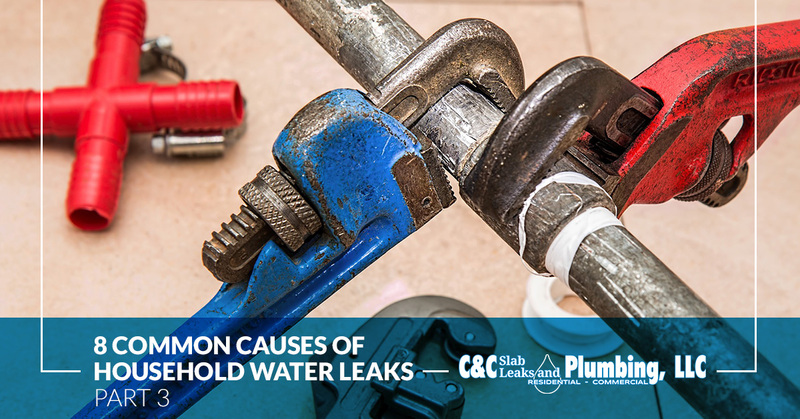 If you have already ruled out water pressure, vegetation, joint damage, loose connections, and extreme temperature changes as causes of your leak; perhaps you’ll find the answer in our final segment. Clogged pipes are the source of a host of plumbing problems causing backups, leaks, and pipes to burst. Even with the use of drain covers, hair and debris can still sneak through. In kitchen sink pipes, build up of sticky fat from pans can build upon pipe walls, just like our arteries, and collect debris that would otherwise pass by without a problem. Problem: Clogged pipes can cause a lot of problems in your home’s plumbing system. Clogs can smell terrible and continue to get bigger. Clogs are more than just a stinky inconvenience that slows your water from draining; clogs cause the pressure to build up in your pipes, which can cause them to crack, break, or eventually burst. Solution: Chemical drain cleaners can get your water flowing a little better, for a little while, but is not a permanent fix. Using a drain snake or taking apart your pipes can help relieve clogs by removing the source of the clog. To prevent clogs, do not allow anything down your drains except fluids. If something accidentally slips down the drain, attempt to recover the item, or if it is too small to recover, attempt to flush it through the piping system. When in doubt, call a plumber! Seals are found in all the connectors in a piping system. When an appliance is installed, it should come with brand new seals. Even if the connections are done correctly, over time seals can degrade and cause leaks. Problem: Seals are typically rubber or plastic and, over time, break down. They can dry out or crack, no longer creating the seal they were designed for. If this happens, you may see condensation at connection points or puddles under the connections. Solution: Luckily, this is one of the easiest fixes, simply replace the seal! It is a good idea to regularly check seals every now and again so you can notice small issues before they become big, wet problems. Corrosion is the oxidation or breakdown of pipe walls. It can be caused by many factors, including age. Signs of corrosion can be seen in the discoloration or warping of the pipe. If you notice thin pipe walls or water accumulation on the outside of the pipe, it is likely due to corrosion. Problem: There are many reasons that pipes may start to corrode and leak. Very old pipes can naturally break down over time. Old copper pipes may start to rust, this chemical reaction is degrading to the integrity of your pipes. Regular rainwater and tap water have a pH balance of about 5.4; if the pH becomes higher or lower, it can burn the walls of pipes. Pipe cleaners and other caustic substances that are meant to eat away at blockages, can also eat away at your pipe walls. Water temperature also affects the rate of corrosion, hotter water increases oxidation. You may notice more issues in hot water pipes than cold water pipes. Over time weakened pipe walls aren’t able to hold water as well and can cause leaks. Over this series, we have discussed eight of the most common reasons for household water leaks. This is by no means an all-encompassing list. We have offered some easy solutions and suggestions on things to be aware of and look out for. If you are ever in doubt or have a leaky pipe, it is always a good idea to consult the professionals. A plumber is a leak expert and will know just what to do! For all your water leak problems in the Dallas area, call C & C Slab Leaks and Plumbing today.